TUESDAY UPDATE: The Citadel budget cutbacks have claimed local sports radio in RHODE ISLAND. The struggling broadcast company pulled the plug this morning on "The Score" (WSKO 790 Providence/WSKO-FM 99.7 Wakefield-Peace Dale), replacing it with satellite-fed True Oldies Channel on the AM side and with an FM simulcast of news-talk WPRO (630). Fans of Opie & Anthony, who had been heard on 99.7, will have to try to pick them up from Boston's WBCN; fans of the Jim Rome show are out of luck for now - and as for the Yankees, who'd been a WSKO staple, we don't know yet. *It's rare that we start the column with an obituary, but in his 56 years, Fred Horton touched so many radio people in his native upstate NEW YORK and beyond that it seems only fitting he lead off this week's issue. Horton grew up in Syracuse and began his radio career there, as one of the many jocks to pass through the doors of WOLF, then across town at WNDR. After that, his travels took him all across upstate New York, including stints at WAAL in Binghamton, WRUN/WKGW in Utica, WGNA/WPYX/WTRY in Albany (where he's credited with making WGNA's country format into a major player), WSEN and WYYY back in Syracuse, WCMF in Rochester, and some time as a record promoter in Buffalo. In 1993, Horton became PD of New York's country WYNY (103.5), scoring the station its highest ratings in that format before its flip to WKTU. Horton also worked in Connecticut, as PD/station manager at WDRC, in Grand Rapids at WGRD, and in Memphis at WGKX. More recently, he worked in Rochester as morning man and PD at WBEE-FM (92.5) in the late nineties, moving to Erie, PA in 2001 to be morning man (and eventually operations manager) at WXTA (97.9 Edinboro), a job he held until just last year. "Uncle" Fred was a radio guy to the core, as his colleague Cary Pall fondly remembers in a posting on his blog, and remained passionate about the medium even in the last days of his fight against cancer, which claimed his life last Tuesday (March 4). Funeral services for Horton will be held March 15 at 1 PM at Calvary Chapel in Liverpool; he's survived by his mother, two daughters, six grandchildren and numerous nieces and nephews - and by a region full of radio people who were lucky enough to have worked for him, or even to have listened to him along his journey. Up the dial at WWRL (1600 New York), we're hearing that morning host Richard Bey is out after less than five months. The morning slot at the progressive talker has been notoriously unstable of late; Bey and Mark Riley took over from Armstrong Williams and Sam Greenfield last October, and Riley was replaced by Coz Carson in January. The city's newest "radio" station, "Pulse 87," WNYZ-LP (Channel 6, aka 87.7 FM) is adding airstaff. The dance station brings Jimmy "Showboat" Fields, late of WKTU, aboard for evenings, while former WCAA (La Kalle 105.9) jock Laura Stylez joins for weekends. Upstate, Ticonderoga's WIPS (1250) went silent at noon on Feb. 29, and it won't be returning to the air, at least not under current owner BisiBlue LLC. The company, a division of Crown Point Network Technologies, tells the Plattsburgh Press Republican that ad revenue never developed in the seven years it owned the station, and that it was sustaining losses of $3,000 a month at the end to keep the 1 kW daytimer on the air. It's been less than a year since WCFE (Channel 57) in Plattsburgh lost its Lyon Mountain transmission tower to an April ice storm, and just a few months since the station made it back on the air from a rebuilt tower - and now "Mountain Lake PBS" is off the air again. Blame a tower crew that was trying to get to the top of the new tower to change a beacon light - a crew member dislodged a chunk of ice that hit the transmission line as it was falling, denting it beyond usability. WCFE-DT (Channel 38) is back on the air from a lower standby antenna, and the station hopes to be back on the air with its analog signal sometime today. Down the road in Albany, WXXA (Channel 23) has lost its news director of four years. Gene Ross is headed south to sister Clear Channel (for now) TV stations WTEV/WAWS in Jacksonville, Florida, where he'll serve as news director at that CBS/Fox pair of stations. On the radio side of things in Albany, the new owners at WGDJ (1300 Rensselaer) are applying for more power. The talk station currently runs 5 kilowatts day and night, with four towers by day and a very directional six-tower pattern at night. It can't do much about the pattern, but WGDJ has applied to boost power to 10 kW days, 8 kW at night from its existing array south of Albany. In Syracuse, Ed Levine's Galaxy Communications has been granted a construction permit for a slight power increase at WZUN (102.1 Phoenix). "Sunny 102" stays put at its existing tower site in Warners, right where I-690 meets the Thruway, and it stays put at its existing 6 kW power level, but it will raise its antenna from 265' to 312' above average terrain. Entercom is moving airstaff around at its Rochester cluster: starting Wednesday, Brian Robinson will move his afternoon show from classic hits WBZA (98.9 the Buzz) to classic rock WCMF (96.5). That's the shift formerly occupied by Big Marc, who's now part of the CMF morning show. On the public radio front, Mordecai Lipshutz is retiring from Rochester's WXXI-FM (91.5) after 32 years with the station, most of them as its afternoon host. No replacement has been named yet. Down the Thruway in Buffalo, Gabe DiMaio is changing public radio stations: he's moving from WBFO (88.7), where he was operations manager and local host of All Things Considered, to WNED-FM (94.5), where he'll serve as program director of the classical station. Here's a call change nobody's likely to notice: WMJQ (1330 Ontario) has changed calls to WYNY. The as-yet-unbuilt construction permit east of Rochester traded its calls with those of a station on 1240 in Cross City, Florida, west of Gainesville. Moving south, there's a new translator on the air in Geneva. W239BJ (95.7) signed on last week, relaying public broadcaster WRVO (89.9 Oswego) - not an easy feat, with rival public station WEOS (89.7 Geneva) just down the dial. And there's another New York obituary to report as well: Ronnie Italiano was better known as "Ronnie I" on a series of Big Apple outlets that included WHBI (105.9 Newark, now WCAA), its successor WNWK and later WNYE (91.5), where he kept the torch burning for doo-wop music. As founder of the organization United in Group Harmony, he was one of the protesters when WCBS-FM dropped doo-wop music (and then its oldies format entirely) a few years ago. Italiano died last Monday (Mar. 3) after a long fight with liver cancer. *In MASSACHUSETTS, Glenn Ordway is off the air at WEEI (850 Boston) while he deals with a family crisis. Ordway's wife, Sarah, gave birth to a baby girl, Mia Grace Ordway, on Feb. 28, but both mother and baby suffered injuries during the delivery. The baby is in intensive care at Children's Hospital, and Ordway, very understandably, is focusing his energies on his family rather than on the station. "By nurturing Sarah back to health quickly, I believe that we can allow the mother and baby bonding process to happen and subsequently increase baby Mias chances for a recovery," Ordway said in a statement released by the station. Guest hosts are handling Ordway's duties on the air, and the "Whiney Awards" ceremonies scheduled for Tuesday have been postponed until April 3. In happier WEEI news, "Dale and Holley" co-host Michael Holley has signed what the station calls a "new multi-year contract" that will keep him in place on the sports station's 10 AM-2 PM shift. Down the hall at talker WRKO (680), executive producer Tom Shattuck has given his notice. He's reportedly jumping ship to rival talk station WTKK (96.9), and he's said to be quite unhappy over WRKO's treatment of his friend Moe Lauzier, who was ousted from his Saturday shift after a quarter-century. Over at Boston's other sports station, WAMG (890 Dedham)/WLLH (1400 Lowell), the last thing they needed was more bad publicity - but that's what "ESPN 890" got last week, after David Scott's "Scott's Shots" column at Boston Sports Media Watch exposed the misuse of football tickets that had been donated to the station for use at a charity event. Scott reports that two of the Pats-Giants tickets, donated by the Giants organization, were indeed sold at a charity auction last summer - but that WAMG general manager Jessamy Tang kept the other pair of tickets for use as a station giveaway. A WAMG lawyer tells Scott that the giveaway was a "mistake," and that better controls will be put into place to make sure it doesn't happen again. In Fall River, Mike Moran has departed WSAR (1480), where he co-hosted from 6-9 AM with Hec Gauthier, then had an hourlong talk show of his own. And at Worcester's WCRN (830), Telegram & Gazette columnist Diane Williamson is joining the roster of talk hosts. Williamson will be learning on the job, co-hosting the 1-2 PM hour with Hank Stolz on Tuesdays and Thursdays before taking over the slot five days a week sometime soon. *There's a frequency flip coming in southeastern CONNECTICUT, though one of the stations involved actually transmits from RHODE ISLAND and the other from Long Island. On March 18, Citadel will swap facilities between talker WXLM (102.3 Stonington CT) and classic rock "Wolf" WMOS (104.7 Montauk NY). The idea is to improve the reach of the Wolf, which broadcasts from studios at the Mohegan Sun casino but has trouble being heard in much of the region because of a signal that sometimes doesn't make it across Long Island Sound very well. Moving the Wolf to 102.3, with a transmitter site just north of Westerly, will solve that problem; the talk format on WXLM, meanwhile, will run in mono when in moves to 104.7, which should make the weaker signal more tolerable. *In other Ocean State news, WRNI (1290 Providence/102.7 Narragansett Pier) is adding to its news staff. Veteran WHJJ (920) news director John Carpilio, who's most recently been with Metro Networks, joins WRNI as news/program director. He replaces Mark Degon, who becomes managing editor at former WRNI parent WBUR in Boston. WRNI-FM is hoping to improve its signal; it's applying for a power increase from 1950 watts to 6 kW, adding a directional antenna to avoid new interference with WXLM and Boston-area WKLB (102.5 Waltham). *Several weekend specialty shows are history at VERMONT's "Point" stations, WNCS (104.7 Montpelier)/WRJT (103.1 Royalton)/WDOT (95.7 Danville), as George Thomas' "Global Jam" and Lou D'Antonio's "Jazz Spectrum" have given way to more of the station's regular AAA format on Sunday nights. *Radio people on the move in NEW JERSEY: At the Access.1 cluster in Atlantic City (WMGM/WTKU/WJSE), Nick Giorno is out as director of programming, replaced by former WYSP (94.1 Philadelphia) production director Rich DeSisto. DeSisto also takes afternoon drive on WMGM (103.7 the Shark), while Scott Reilly becomes assistant PD and afternoon jock on WJSE (102.7), replacing Shawn Castelluccio. We're also hearing about budget cuts at Access.1's TV operation, WMGM-TV (Channel 40), which has apparently shut off its main analog transmitter and is operating with its backup unit at just 1 kW ERP until the demise of analog TV in less than a year. At the other end of the state, WRNJ (1510 Hackettstown) has begun relaying its programming over two FM translators. W284AQ (104.7 Hackettstown) and W224AS (92.7 Washington) had been rebroadcasting WBGO (88.3 Newark) until the FCC granted special temporary authority to relay the AM daytimer instead. *It was a quiet week in PENNSYLVANIA, but there's at least one new signal on the way. WGLD (1440 Red Lion) will complete its move to Manchester Township, near York, by the end of March. Operating from the WSBA (910 York) transmitter site, it appears the new WGLD may be a sports station - it's signed on to the Phillies' radio network for the 2008 season. *Lots of news to report from CANADA this week, beginning with the grant of a big AM-to-FM move on Quebec's Gaspe Peninsula. CHNC (610 New Carlisle) and CHGM (1150 Gaspe) will trade their AM signals for a network of five FM facilities: 107.1 in New Carlisle, with 6 kW DA/169 m; 99.3 in Gaspe, with 468 watts DA/73 m; and relays on 99.1 in Carleton, 98.3 in Chandler and 107.3 in Perce. Another Gaspe Peninsula application was denied: Radio du Golfe won't be allowed to put new signals on the air at 92.7 in Gaspe and Riviere au Renard. In Montreal, CHOU (1450) wants more power. The ethnic station signed on last year with 1 kW full-time, but it tells the CRTC it needs to double that to 2 kW to fully serve its market. There's a format change in southwestern Ontario: CFCO (630 Chatham-Kent) dropped its longtime oldies format last Monday, becoming "Country 92.9," branding itself with the frequency of its low-power FM relay instead of its wide-coverage AM outlet. Sister station CKSY (94.3) has rebranded as "Lite Hits 94.3." It's not the only country station in the neighborhood, either: in Leamington, CJSP (92.7) signed on Monday with country. Over in Kingston, UCB Canada has been granted a 50-watt relay on 100.5 for its CKJJ (102.3 Belleville). In Nova Scotia, Wayne Harrett's Seaside FM (CFEP 94.7 Eastern Passage) has been dealt a setback in its attempt to raise power from its current 50 watts to 1.4 kW. While the station received CRTC approval for the power increase back in November, it hit an objection from MBS Radio, which says the increased power at CFEP could cause interference to its CKWM (94.9 Kentville). Despite an offer from Harrett to increase the power at CFEP in steps, allowing MBS to gauge whether or not actual interference to CKWM would result, the two sides couldn't come to an agreement - and now Seaside FM will apparently have to look for a new frequency for its power increase, at a cost of at least C$10,000 to the volunteer operation. A veteran Montreal radio newsman has retired. Frank McCormick came to CKGM-FM (97.7, now CHOM) in the 1960s, and moved to the CBC in the 1980s. McCormick delivered his last newscast for CBC Montreal on Feb. 29. *And we close out this week with a new feature we're calling the NERW Bookshelf, reviewing books our readers might find of interest. Jerry Williams defined talk radio in Boston for decades, and his promos at WRKO touted him as "The Dean of Talk Radio." 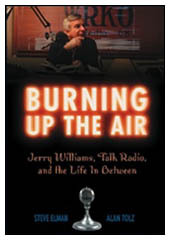 But as his former producers Steve Elman and Alan Tolz recount in their new book, Burning Up the Air: Jerry Williams, Talk Radio and the Life In Between (Commonwealth Editions), Williams' contributions to the field were actually even deeper; indeed, his now largely forgotten early career at stations such as WKDN in Camden, New Jersey, WIBG in Philadelphia and WMEX in Boston qualifies him as an inventor of the format. In this compulsively readable volume, Elman and Tolz dig deeply into Williams' personal life, tracing his difficult childhood in Brooklyn and his oft-exaggerated earliest days in radio at WCYB in Bristol, Virginia, WEDO and WLOA in Pittsburgh and WKAP in Allentown. They also paint a colorful picture of skinflint WMEX owner Mac Richmond ("one of the legendary whack jobs of broadcasting") and the technical challenges of live talk radio in the late fifties, when Williams broadcast his late-night show in front of a live audience at the WMEX studios at Brookline Avenue, a time when anyone could - and did - wander in from the streets. The book follows Williams away from Boston to his successes in Chicago at WBBM, then through his return to Boston to even greater acclaim at WBZ, the challenges that followed his 1976 break with that station, and his triumphant return to the Boston airwaves as the signature voice of "The Talk Station," WRKO, beginning in 1981. The authors do a masterful job of capturing Williams' voice in print, aided by a sizable collection of vintage airchecks (many of them available for listening at the companion website, jerrywilliams.org.) They're also assisted by reams of paperwork, much of it rescued by the authors from Williams' South Shore barn. At the same time, Elman and Tolz don't try to sugarcoat Williams' rocky personal life, chronicling in detail his marriages and his affairs over the decades. They also paint a painful picture of his later years, as repeated station sales and management changes and the rise of newcomers like Howie Carr diminished Williams' influence at WRKO and as illness took its toll on the aging talk host. 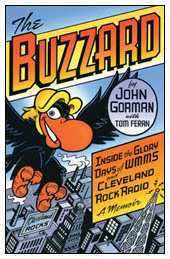 Another recent radio-related book, John Gorman's The Buzzard: Inside the Glory Days of WMMS and Cleveland Rock Radio (Gray & Co.), wouldn't seem to be NERW-related at first (unless you count WMMS' fringe signal into a few corners of northwestern Pennsylvania), but it turns out that the legendary rocker from the "North Coast of America" had some deep roots in Boston, of all places. Gorman, who served as WMMS program director from 1973-1986, is a native of South Boston who got his start in Boston radio at WORL, WHDH-FM and the early WNTN - and early on, he drew heavily on the Boston scene for the talents who turned WMMS into one of the most respected FM stations in America. At times, the station was home not only to Denny Sanders, another veteran of WNTN and MIT's WTBS, but also to music director Donna Halper, morning jock Debbie Ullmann, and later to WVBF alumni Charlie Kendall in mornings and "BLF Bash" in overnights. Just as Burning Up the Air is a story not just of Jerry Williams but of the birth of talk radio in general, The Buzzard is a time capsule of an era when FM rock stations were emerging from the underground and becoming big business. The stories Gorman tells - of the sneaky ways WMMS obtained preview copies of new releases and evaded record company cease and desist orders, of the battles between station staffers and corporate management, and most of all of the promotional and programming wars between WMMS and the many stations that tried (never with any great success) to knock it off its perch. And just as the Williams book comes to something less than a happy ending, as the fading master of talk tries to recapture his magic at ever-smaller stations up the dial, so does Gorman's book end in the only real way possible, with new management tampering with the formula that kept WMMS successful even as its music mix kept changing. That formula, as Gorman defines it, was to make WMMS not a rock station or a top 40 station, but a "popular culture" station, programmed with full-service elements such as traffic and business reports along with music that crossed genre and format lines. While Gorman's book closes in 1986 with his departure from WMMS (he'd return a decade later for a short stint under new ownership), we know what came next. For anyone who's been reading Gorman's opinionated views of today's radio scene at his Media Blog, especially his pointed critiques of HD Radio and its promoters, The Buzzard helps support his thesis that there's still another direction the business could be following. It's usually not a big deal when a radio station owner LMA's its signal out to another broadcaster - but when the station is a 50 kilowatt AM, the owner is Clear Channel, and the other broadcaster is a public radio station, why, that's a lead story. It's happening in western MASSACHUSETTS, where WFCR (88.5 Amherst) has been pioneering the whole public-radio-LMA concept for the last decade, leasing WPNI (1430 Amherst) from owner Pamal to run a separate slate of public radio news and talk programming for listeners in the Pioneer Valley who can hear the 5000-watt daytimer. But with WFCR's reach extending far beyond Hampshire County these days, the broadcaster was looking for new ways to bring its second service to a wider audience. (It's extending its main service through new translators, too - W254AU on 98.7 in Great Barrington just came on the air, to be followed soon by new signals in Lee and Pittsfield.) Clear Channel, meanwhile, has the big signal of WNNZ (640 Westfield), which has been doing Fox Sports Radio - but now has some big FM sports-talk competition in the Springfield market in the form of WVEI-FM (105.5 Easthampton). How to do something productive with the 640 signal without cannibalizing Clear Channel's news-talk market leader, WHYN (560 Springfield)? The answer will debut April 2, when Clear Channel begins leasing WNNZ to WFCR, which will move the WPNI program lineup down the dial to 640. By day, the 50 kW signal will cover much of western Massachusetts and big chunks of Connecticut and even eastern New York. At night...well, at least WNNZ, unlike WPNI, has a night signal, though its one kilowatt barely even reaches Springfield. Clear Channel will also sell some of the underwriting for the WFCR programming on WNNZ, apparently splitting the revenue with WFCR. The Springfield Republican reports that WFCR is building a studio at the WGBY-TV (Channel 57) building in downtown Springfield to improve its coverage of Hampden County, and that the Springfield Falcons AHL team will remain on 640 through the end of this season. What a busy week it's been in NEW YORK! We'll start with two station sales, one expected, the other a surprise: Disney won approval this week to convert its LMA of WEVD (1050 New York) into a $78 million purchase from the Forward Association. Since Disney took over in September 2001, WEVD's been the New York flagship for ESPN radio -- and even made a slight showing in the latest Trends there. We hear that sale will close on or about May 1. The surprise sale was Mega's announcement that it will sell WLXE (1380 New York) back to Arthur Liu's Multicultural Broadcasting, which sold the station to Mega three years ago for $33 million ($24 million in cash and two Washington, D.C. AM outlets). 1380 was leased-time WKDM then; Mega spent quite a bit of cash relaunching the facility as Spanish all-news WNNY. That didn't last, and most recently 1380's been doing regional Mexican as WLXE, "La X 1380." With this sale, we expect the regional Mexican to end and leased time to return to 1380, for which Liu is paying $37 million. The deal gives Multicultural four leased-time AM outlets in New York: WPAT (930 Paterson NJ), WNSW (1430 Newark NJ), WZRC (1480 New York) and WLXE, along with religious WNYG (1440 Babylon) out on Long Island. On the FM side, it was another strange week in the long bizarre saga that is Viacom's WNEW (102.7), now in its second month of stunting with a short playlist of top 40 tunes. After weeks of leaks about an ambitious entertainment-talk format with plenty of synergy from Viacom's MTV and VH1 divisions, New York's tabloids lit up this week with talk that Viacom suddenly had cold feet about the whole idea. Steve Kingston, program director of Viacom rocker WXRK (92.3 New York) was reportedly seen making the rounds of the (nearly empty) WNEW offices -- but then came word that he won't be the operations manager there after all. What in the world is going on there? Nobody knows -- and those promises of a "spring" relaunch at 102.7 are looking as remote as spring itself here in the frigid Northeast. And down in Binghamton, Citadel's WHWK (98.1) wants to move away from the WBNG-TV (Channel 12) transmitter site on Ingraham Hill that it's called home since it signed on all those decades ago (when it was WNBF-FM and channel 12 was WNBF-TV.) The station has applied to move to a directional antenna on the new tower nearby on Ingraham Hill that will be home to WSKG-TV/DT and WSKG-FM (89.3); from there, it will run 6500 watts at 401 meters above average terrain, with a sharp null to the south. Why a directional antenna in Binghamton? For that, we look across the state line to PENNSYLVANIA, where Citadel also owns WBSX (97.9 Hazleton), which has long been short-spaced to Binghamton (as well as to WOGL 98.1 in Philadelphia, WSKQ 97.9 in New York and WIYY 97.9 in Baltimore!) 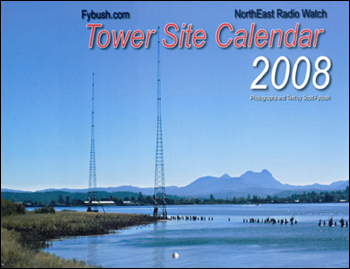 WBSX currently transmits from a tower about halfway between Hazleton and Wilkes-Barre, but now Citadel wants to move it north about six miles, which would land the station on the tower of WMGS (92.9 Scranton) at "Electronic Heights," aka Penobscot Mountain, the primary TV/FM site for Scranton/Wilkes-Barre. WBSX's new facilities would be 6300 watts at 407 meters, with a null to the north protecting WHWK. The heads are beginning to roll at the former Knight Quality stations in New England. Here's what we've heard so far from our sources around the region: Six staffers were dismissed from WTAG (580) and WSRS (96.1) in Worcester early this week, including WTAG program director Skot Pare, morning host Tom Gorham (a 26 year veteran of the station), and evening news anchor Ann Kenda. George Brown, who was recently moved from afternoons to pair with Gorham, stays on morning drive, while talk hosts Upton Bell and Jordan Levy keep their jobs as well. Up north in New Hampshire, all three staff members at WXHT (95.3 York Center ME) are being dismissed, as "Heat 95.3" cools down and picks up a satellite modern AC format. In the same building, WHEB (100.3 Portsmouth) PD/OM Glenn Stewart has been named PD of sister station WGIR-FM (101.1 Manchester) as well. WHEB's new GM is Kim Jones, husband of WGIR PD Ruth Jones. WHEB sales manager Shari Soffen has been dismissed as well. At WGIR, news director Bill Rossi, production manager/talk host Terry Benz, and FM program director Tim Sheehan are all reportedly out, along with sales manager Cathy Cram, who has resigned. Get ready for a simulcast between WGIR-FM and WHEB as well; word has it there's a 15k stereo line being installed to allow the two stations to share late-night and weekend programming.